The American monetary system has been evolving for more than two centuries, with some interesting twists and turns along the way. Did you know that in addition to the familiar cent and nickel, at one time or another five additional coins circulated with a value of five cents or less? Or that for a short time in the 19th century, Americans had the opportunity to use a twenty-cent piece in addition to a twenty-five-cent piece? Such obsolete pieces are unfamiliar oddities today, but they were important and interesting aspects of 19th-century coinage. Our smallest denomination was the half cent, initially struck in 1793. Though a half cent seems to be a trivial amount, when it was introduced it had the purchasing power of the modern dime. It was also useful for transactions involving Spanish-American coins valued at 12½ cents, which circulated in the United States until the 1850s. However, the large coin—almost the size of today’s quarter—was unpopular, and it was issued sporadically and in small quantities. The Coinage Act of 1857, which replaced the 1-cent piece with a smaller version, marked the half cent’s official end. Soon after the start of the Civil War, inflation and hoarding caused small change to disappear from circulation. To facilitate coin production, the Coinage Act of 1864 authorized the issue of bronze one-cent and 2-cent pieces. Having both coins may seem redundant, but in the context of a coin shortage, a 2-cent piece would ease the burden on the cent both in minting and in commerce. The 2-cent piece is notable because it was the first U.S. coin to carry the motto IN GOD WE TRUST, now present on all denominations. Both bronze coins were immediately popular, but as the monetary chaos subsided, the 2-cent piece became obsolete. Its mintage declined every year until its demise in 1873. 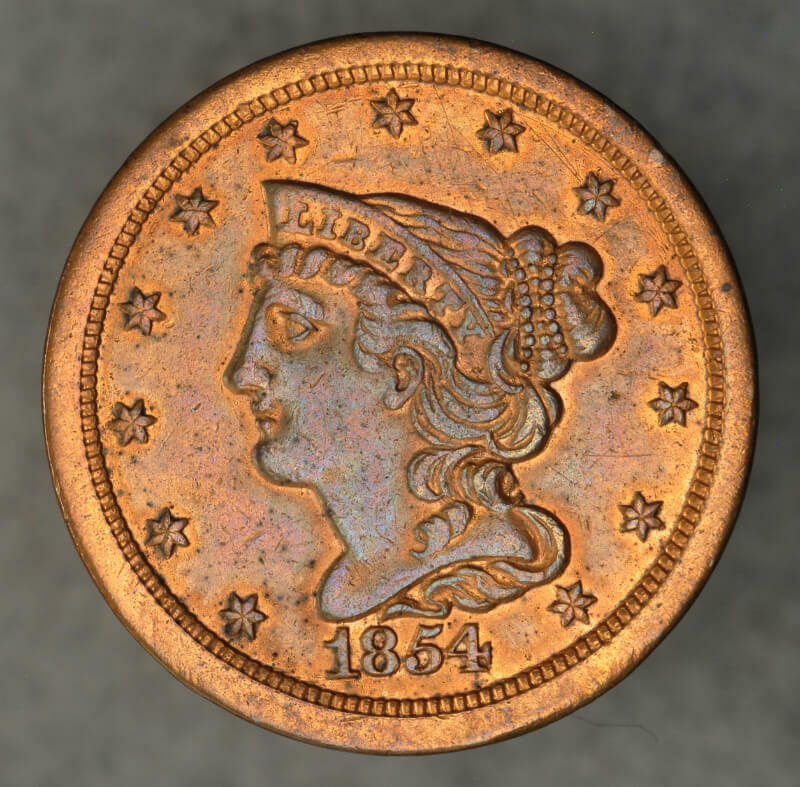 The 3-cent piece might seem to be the ultimate odd denomination, but it served an important practical purpose when it was introduced in 1851. The postage rate had just been lowered to 3 cents, and the small, silver coin was more convenient than three large cents. An economic innovation, it was the first American precious-metal coin with a metal value lower than its face value. This resulted in large early mintages, but the coin disappeared from circulation during the Civil War and was last struck in 1873. Its replacement, the copper-nickel 3-cent piece, debuted in 1865. It, too, was struck only sparingly after its first few years, as the Civil War coin shortage started to subside, and was discontinued in 1889. From today’s perspective, the silver half-dime is an odd denomination, or at least an odd form for the 5-cent denomination. But not only was it one of the coins authorized by the Mint Act of 1792, it was in fact was the U.S. Mint’s very first issue, ordered by George Washington himself, and with a substantial portion of its small mintage distributed by none other than Thomas Jefferson. After this auspicious debut the denomination’s mintage waxed and waned over the ensuing decades, but after the chaos of the Civil War, the half-dime never really recovered. Its successor, today’s copper-nickel 5-cent piece, was introduced in 1866; the silver half-dime was last coined in 1873. The shortest-lived odd denomination was the 20-cent piece, introduced in 1875. Taking a worldwide view of coinage, 20 cents is not an odd denomination at all – in fact, most countries have 20-cent equivalents rather than 25-cent equivalents. And this is not a perfect comparison, but, thinking about currency rather than coins, it’s the $20 bill that seems natural, and a $25 bill would seem “odd.” But when the American monetary system was founded, the binary divisions of the Spanish colonial 8-Reales coin carried the day, and the quarter became a staple of American coinage. The 20-cent piece just couldn’t compete, and ended up with the unfortunate distinction of being our country’s shortest-lived denomination. When it was introduced, minor coins like cents and nickels generally did not circulate in the western United States, and the 20-cent piece was intended to facilitate accurate change-making. But the coin’s similarity in size and design to the quarter caused considerable confusion, and production for circulation ceased after only two years. All of these odd denominations still are legal tender, though of course you won’t find them in circulation. The 20th century almost had some odd denominations of its own, with several possibilities – including one odder than any previous denomination – that attracted some attention but never made it past the drawing board. The Coinage Act of 1792 established “milles or thousandths” as units of account, but the United States Mint never struck a 110¢ denomination. There was never any serious proposal for one, though the terminology has persisted in “millage” rates for property taxes. The tiny units took a tangible form with sales tax tokens, issued in singles and multiples of 110¢ by some states in the 1930s and 1940s, when sales taxes were new and fractions of a cent were worth tracking. These 19th century “odd denominations” were, believe it or not, considered for revival in the 20th century. At the start of World War Two, consideration was given to a silver half-dime or 3-cent piece as a substitute for the nickel five-cent piece. Designs for a new coin (featuring Benjamin Franklin, later to appear on the half-dollar) were approved, but the composition of the 5¢ piece was changed instead to a wartime composition of copper-silver-manganese (i.e., a “nickel” without any nickel) from 1942-1945. The possible reappearance of the 2¢ piece was a consequence of the penny shortage of the 1970s. Chief Engraver Frank Gasparro created drawings, but the project went no further. It’s somewhat surprising that the United States has never had a 2½¢ coin. In the 19th century it would have been useful as a bridge between the Spanish colonial 1 real coin (equal to 18of a dollar, or 12½cents) and the new nation’s decimal coinage. And in the 20th century, a 2½¢ piece would have been useful for multiple pricing, e.g., 2 for 15¢. The Mint Director’s report for 1916 suggested a copper-nickel 2½¢ coin, and hearings were held in 1921 for a 2½¢ coin honoring Theodore Roosevelt. Despite these promising starts, and the potential usefulness of the denomination, the space between 2¢ and 3¢ remained empty. This truly odd denomination would have been the oddest of all. The idea originated with one of the most American of institutions, Coca-Cola. In the 1950s, the price of a bottle of Coke was the same as it had been for more than sixty years: 5 cents. This caused a conundrum: a price increase was desirable, but the company wanted to retain its single-coin vending machines. So, in 1953, the President of Coca-Cola, Robert Woodruff, suggested to President Eisenhower that the Treasury should mint a 7½ cent coin. The proposal never advanced – but the cost of a Coke did.